Considered the most unpredictable race in the 10-race 2011 Chase for the Sprint Cup, the top NASCAR drivers take on the 2.66-mile, high-speed Talladega Superspeedway. This final restrictor plate event on the overall NASCAR Sprint Cup schedule, the race is known to favour almost any driver and team in the right position at the end of the event. For the Good Sam Club 500 event, this benefit came to the Richard Childress Racing pair of Jeff Burton and Clint Bowyer. In a daring final lap move on the Talladega tri-oval section, Bowyer’s #33 Chevy broke the draft and performed a slingshot on his #31 car teammate Burton claiming the win by mere feet. A race comprised of the interaction of the two-car tandem draft, this went contrary to the intent of the NASCAR Sprint Cup Series rule makers plans for the event. 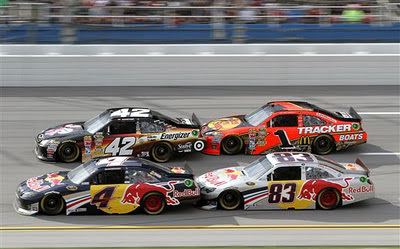 Entering the Talladega Superspeedway race, NASCAR dictated a series of new rules created to combat the increasing level of two-car bump-drafting practice. Despite eliminating teams from using lubricants to grease the bumpers and changes made in the area of the radiator, the two-car tandem re-established itself through the race weekend. Back and better than ever, the two-car tandem dominated the Good Sam Club 500 at Talladega Superspeedway. Going through the first 8 laps with 5 distant drivers leading the Good Sam Club 500, the #17 Roush Fenway Racing Ford of Matt Kenseth made a profound impact early. On course to lead 21 laps through the day working with the #6 Ford teammate of David Ragan, Kenseth’s run at the Talladega Superspeedway is capitalizing on the Charlotte victory. With Roush Fenway Racing driver Matt Kenseth and the #99 car pilot Carl Edwards well in the title hunt for this season, rumours through the weekend at Talladega Superspeedway has indicated the blue oval organization of Ford teams were engaged in a political move on the race track. Reports have circulated that Ford drivers were discouraged to draft with vehicles belonging to any other auto manufacturers. As the race transpired, the multi-car team dynamic obscured any obvious presence of manufacturer orders as corporate teammates of all organizations were paired. There was one incident in the final run of the event involving the #21 Ford of Trevor Bayne and the #24 Chevrolet of Jeff Gordon. As Bayne started to draft with the Hendrick Motorsports car of Gordon, the #21 Wood Brothers Ford suddenly abandoned the Chevy driver in favour of a Roush Fenway Racing Ford. Without a drafting partner, Jeff Gordon plummeted in the final running order to 27th place. In a race consisting of 72 lead changes (falling well short of the Talladega Superspeedway’s promotional stunt where a prize would be rewarded if 100 lead changes occurred), the #14 Chevrolet piloted by owner/driver Tony Stewart would lead most often with 30 laps on the day. Jeff Burton, Clint Bowyer and Matt Kenseth were the only other drivers to lead more than 20 laps during the 188-lap event. Slowed nine times by caution, five of the yellow flags on the day fell in reaction to multiple-car accidents. 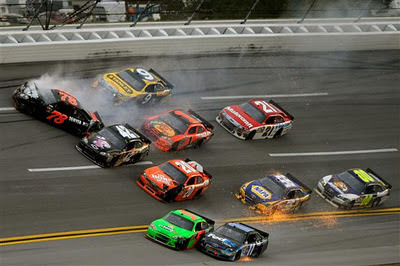 The first major accident crucial to the 2011 NASCAR Chase standings on lap 105 collected the cars of Kevin Harvick and Kyle Busch among the 6 vehicles. A crash started when the Richard Petty Motorsports cars of AJ Allmendinger and Marcos Ambrose made contact, Allmendinger’s spinning #43 Ford tagged Kyle Busch’s #18 Toyota before collecting others. Both championship contenders required crew service in the Talladega Superspeedway garage area, Harvick finished the race in 32nd place while Kyle Busch was listed 13 laps down in the final results crossing the start/finish line in 33rd place. Another crash that could have had dire consequences for the Chase standing in the Good Sam Club 500 transpired on lap 164. Set off when the #32 Ford driven by Terry Labonte made incidental contact with the #71 Ford of Andy Lally sending him sideways. Right behind the sliding #71 car was the #48 Chevrolet of Jimmie Johnson who just barely missed collection. Though contact between the #71 and #48 occurred, the damage was not serious enough to require immediate attention. Penske Racing’s Chase contender Kurt Busch would not be so lucky when he collided with a spinning car of Bobby Labonte 11 laps later. Losing oil pressure, Busch’s #22 Dodge also lost considerable ground for securing a chance at the 2011 title. The final multi-car crash in the Good Sam Club 500 involved five cars out of turn two. Receiving the most serious hit head-on with the Talladega wall was the #78 Chevrolet of Regan Smith. Though sustaining severe front-end damage, Smith climbed out of the car uninjured. One positive development of the two-tandem appears to be reducing the traditional multi-car “Big Wreck” crashes consisting of double-digit involvement. However, three of the caution during the Talladega Superspeedway NASCAR Sprint Cup race was attributed to mistakes during the two-car bump-drafting exercises. On lap 81, it was the Stewart/Haas Racing #14 and #39 stock cars spinning on the frontstretch. Also happening on the frontstretch was a tangling between the Red Bull Toyotas on lap 130. Both pairs recovered to continue running with the Red Bull cars even breaking into the top-10 in the race’s final results. With the race ending with a dramatic last-lap battle between Bowyer and Burton, the Good Sam Club 500 at Talladega Superspeedway delivered some definite surprises. When stock cars crossed the checkered flag on lap 188, nine of the top ten finishing race cars started from deep in the field. With Clint Bowyer the only drive to qualify within the top-12, Jeff Burton surged from 27th to a runner-up spot to almost win the Talladega event. Finishing third for the Tommy Baldwin Racing team, Dave Blaney brought the #36 Chevy from 41st to finish 3rd ahead of 2009 spring Talladega race winner Brad Keselowski. In 5th and 6th place, the Team Red Bull pair recovered from the mid-race trials. Brian Vickers led Kasey Kahne across the line in Toyotas. One note was the ineffectiveness of the Hendrick Motorsports team in the race’s final run. After Jimmie Johnson won the spring race at Talladega, tandem pairing of Johnson and Dale Earnhardt Jr seemed as if it could be a strong combination. Leading only three laps combined through the Good Sam Club 500, their strategy of waiting in the back of the field for a late race charge backfired. While Jimmie Johnson’s #48 Chevrolet escaped danger through the Andy Lally lap 164 crash, the caution periods in the final laps left too little time for the Hendrick Motorsport pairing to make an impact for even a top-10 finish. The 2011 NASCAR Sprint Cup Chase standings see the Roush Fenway Racing group gain commandingly after issues brought complications to other contenders. Carl Edwards (who finished in a safe 11th place at Talladega) now holds a 14-point lead over teammate Matt Kenseth. Brad Keselowski is only 4 points behind Kenseth in third place and is a single point ahead of Tony Stewart. Kevin Harvick is now 26 points away from Carl Edwards with only four races remaining in the 2011 season. Heading to the Martinsville Speedway short track, the 2011 NASCAR Sprint Cup Series leaves the fastest track in the season for the slowest.